Trafalgar Square is located to the east of Buckingham Palaceat the far end of the ceremonial road The Mall. 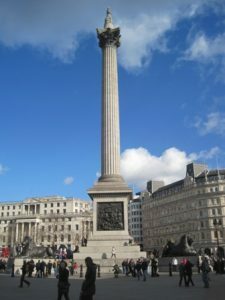 The central 43 metre high granite Nelson’s Column was completed in 1843 to commemorate Horatio Nelson’s naval victory over the French off Cape Trafalgar in 1805. The statue of Nelson atop the column faces southwest down The Mall towards Buckingham Palace which became the official residence and headquarters of the monarch on the accession to the throne of Queen Victoria in 1837 six years before the completion of the column. The four monumental bronze lions which are set at each of the four corners of the plinth of the column were designed by Edwin Landseer and added in 1867. The square has two large fountains and a number of statues. One of the plinths is reserved for contemporary art with specially commissioned exhibits displayed on a temporary basis. The people of Oslo have sent a giant Christmas tree for the square every year since 1947 in gratitude for support of Norway during the Second World War. The square is the location for annual exuberent New Year’s Eve celebrations. 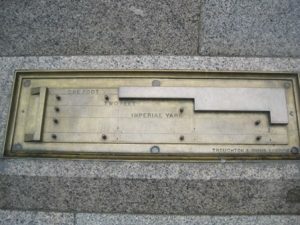 Set into the wall in the north east corner of the square is a plaque setting out the standard imperial measurements of length of an inch, a foot and a yard (see picture below). This was installed in 1876 by the Board of Trade. To the south of the plaque is the smallest police station in the world. This cylindrical room was allegedly installed to allow police to unobtrusively spy on demonstraters in the square through its tiny slit windows. It had a direct telephone line to Scotland Yard and was installed some 40 years after Bloody Sunday 1887 when hundreds of demonstrators of the Labour movement were injured and three killed by the police. It is now used to store cleaning equipment. To the north of the square and raised well above its level is the National Gallery and the terrace outside affords good views over the square. To the north east is the church of St Martin in the Fields. To the east is South Africa House (the High Commission of South Africa). To the south is Whitehall with the Houses of Parliament at the far end. To the south west is Admiralty Arch with The Mall beyond leading to Buckingham Palace. To the west is Canada House (the High Commission of Canada). 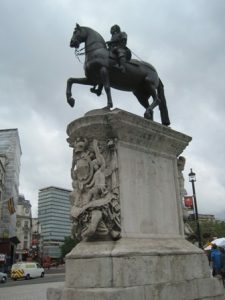 In the southern part of Trafalgar Square is a statue of King Charles I mounted upon a horse ang gazing down Whitehall towards the Houses of Parliament. Charles I caused a civil war by forcing his way into parliament trying to arrest 5 MPs. Prior to this incident the statue was erected in Covent Garden in1633 but was taken down after Charles was beheaded. The new puritan government sold the statue to a metal dealer – Mr Rivett – on the understanding that it would be taken apart. Mr Rivett subsequently made a fortune by selling small bits of metal which purchasers understood to be a part of the statue. After the population got thoroughly fed up with the edicts of the puritan government and instated the debauched Charles II onto the throne, Mr Rivett made another fortune by disclosing that he had in his cellar the intact statue of Charles I which he proceded to sell to Charles II who had it set up in Trafalgar Square where it stands to this day.